An informer, denunciator, or delator; synonyms are "masor" (abstract, "mesirah"), "delator" ( ), and "malshin" (abstract, "malshinut"), from the last of which are derived the Portuguese "malsim," and also the Spanish "malsin," together with the adjective "malsinar" and the abstract nouns "malsindad" and "malsineria." Nothing was more severely punished by the Jews than talebearing; and no one was held in greater contempt than the informer. On account of the fact that his deeds frequently caused mischief and even entailed death and destruction, the sages of the Talmud compared the "moser" to a serpent. The Jews suffered much during the persecutions under Hadrian through informers in their own ranks; especially teachers of the Law were betrayed by the delators. Simeon ben Yoḥai, having criticized the Roman government, was denounced; and he saved his life only by hasty flight. A certain Eleazar b. Simon is said to have denounced to the Romans Jews who were engaged in freebooting expeditions against them. 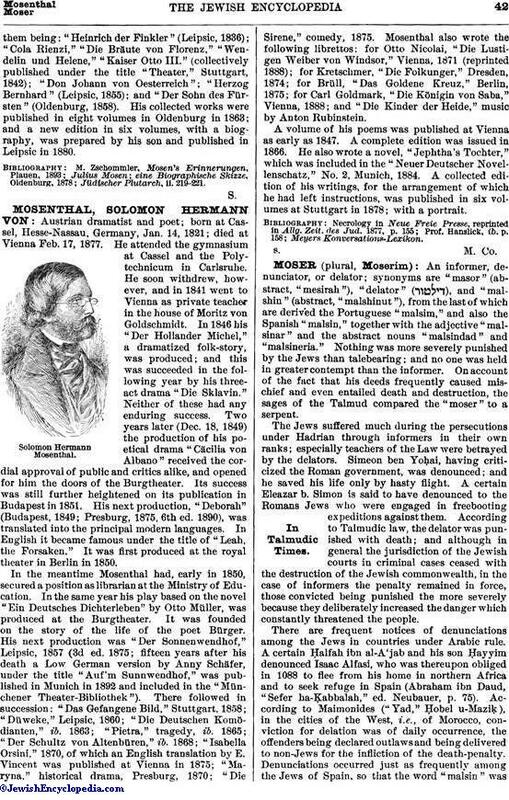 According to Talmudic law, the delator was punished with death; and although in general the jurisdiction of the Jewish courts in criminal cases ceased with the destruction of the Jewish commonwealth, in the case of informers the penalty remained in force, those convicted being punished the more severely because they deliberately increased the danger which constantly threatened the people. There are frequent notices of denunciations among the Jews in countries under Arabic rule. A certain Ḥalfah ibn al-A'jab and his son Ḥayyim denounced Isaac Alfasi, who was thereupon obliged in 1088 to flee from his home in northern Africa and to seek refuge in Spain (Abraham ibn Daud, "Sefer ha-Ḳabbalah," ed. Neubauer, p. 75). According to Maimonides ("Yad," Ḥobel u-Maziḳ), in the cities of the West, i.e., of Morocco, conviction for delation was of daily occurrence, the offenders being declared outlaws and being delivered to non-Jews for the infliction of the death-penalty. Denunciations occurred just as frequently among the Jews of Spain, so that the word "malsin" wasadopted into the Spanish language (see above). The great Talmudist of Lucena, Joseph ibn Migas, caused an informer to be stoned before the close of a certain Day of Atonement which fell on a Sabbath (Judah b. Asher, "Zikron Yehudah," p. 55b). Isaac b. Sheshet at the end of the fourteenth century could therefore assert that from olden times it had been law and custom in the Jewish communities of Aragon, Valencia, Catalonia, Castile, and Navarre to put informers out of the world; and even as late as 1432 the representatives of the Castilian communities could with truth allege in the statutes which they had drawn up that it was the custom throughout Israel to put to death one who at any time or any place dared to act the part of informer. In Barcelona a descendant of a wealthy and respected family who had lost his fortune turned informer. In vain was he warned and threatened with an informer's death. He was probably favored by the authorities and encouraged to continue in his nefarious conduct; and he was not to be enticed from his chosen path. His own family wished to get rid of him, and insisted on his being prosecuted. Rabbi Jonah of Gerona (nephew of Jonah b. Abraham Gerondi) and Solomon ben Adret of Barcelona, because of the insistence of King Pedro III. of Aragon, found themselves forced to let justice take its course and to deliver the informer to the king. The latter ordered his execution, which took place in the year 1280 in the square before the Monjuich, the Jewish cemetery in Barcelona, the arteries of both arms being opened (Solomon ben Adret's Responsa in "J. Q. R." viii. 228). 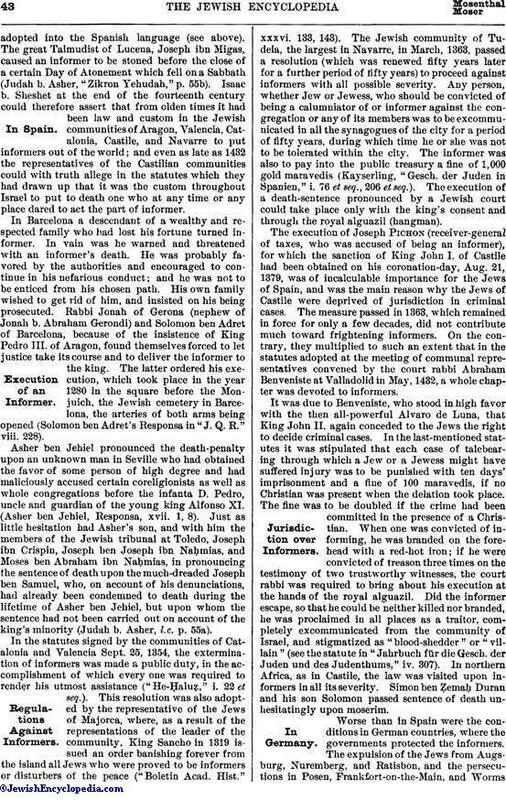 Asher ben Jehiel pronounced the death-penalty upon an unknown man in Seville who had obtained the favor of some person of high degree and had maliciously accused certain coreligionists as well as whole congregations before the infanta D. Pedro, uncle and guardian of the young king Alfonso XI. (Asher ben Jehiel, Responsa, xvii. 1, 8). 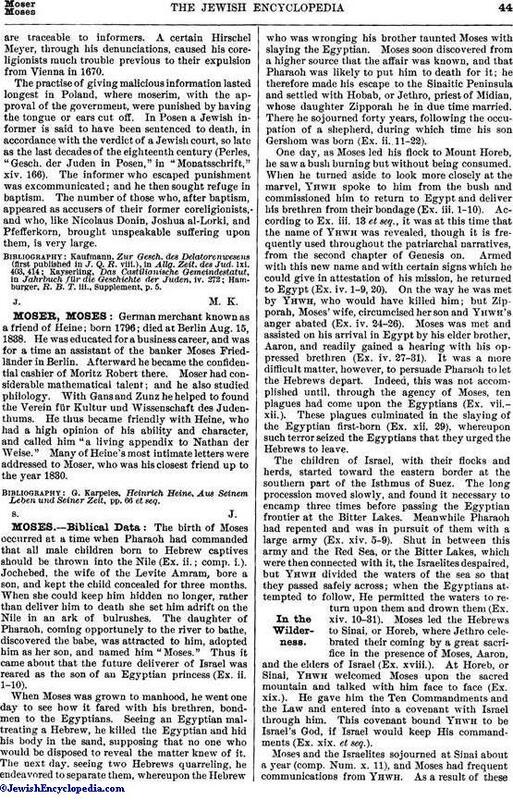 Just as little hesitation had Asher's son, and with him the members of the Jewish tribunal at Toledo, Joseph ibn Crispin, Joseph ben Joseph ibn Naḥmias, and Moses ben Abraham ibn Naḥmias, in pronouncing the sentence of death upon the much-dreaded Joseph ben Samuel, who, on account of his denunciations, had already been condemned to death during the lifetime of Asher ben Jehiel, but upon whom the sentence had not been carried out on account of the king's minority (Judah b. Asher, l.c. p. 55a). In the statutes signed by the communities of Catalonia and Valencia Sept. 25, 1354, the extermination of informers was made a public duty, in the accomplishment of which every one was required to render his utmost assistance ("He-Ḥaluẓ," i. 22 et seq.). This resolution was also adopted by the representative of the Jews of Majorca, where, as a result of the representations of the leader of the community, King Sancho in 1319 issued an order banishing forever from the island all Jews who were proved to be informers or disturbers of the peace ("Boletin Acad. Hist." xxxvi. 133, 143). The Jewish community of Tudela, the largest in Navarre, in March, 1363, passed a resolution (which was renewed fifty years later for a further period of fifty years) to proceed against informers with all possible severity. Any person, whether Jew or Jewess, who should be convicted of being a calumniator of or informer against the congregation or any of its members was to be excommunicated in all the synagogues of the city for a period of fifty years, during which time he or she was not to be tolerated within the city. The informer was also to pay into the public treasury a fine of 1,000 gold maravedis (Kayserling, "Gesch. der Juden in Spanien," i. 76 et seq., 206 et seq.). The execution of a death-sentence pronounced by a Jewish court could take place only with the king's consent and through the royal alguazil (hangman). The execution of Joseph Pichon (receiver-general of taxes, who was accused of being an informer), for which the sanction of King John I. of Castile had been obtained on his coronation-day, Aug. 21, 1379, was of incalculable importance for the Jews of Spain, and was the main reason why the Jews of Castile were deprived of jurisdiction in criminal cases. The measure passed in 1363, which remained in force for only a few decades, did not contribute much toward frightening informers. On the contrary, they multiplied to such an extent that in the statutes adopted at the meeting of communal representatives convened by the court rabbi Abraham Benveniste at Valladolid in May, 1432, a whole chapter was devoted to informers. It was due to Benveniste, who stood in high favor with the then all-powerful Alvaro de Luna, that King John II. again conceded to the Jews the right to decide criminal cases. In the last-mentioned statutes it was stipulated that each case of talebearing through which a Jew or a Jewess might have suffered injury was to be punished with ten days' imprisonment and a fine of 100 maravedis, if no Christian was present when the delation took place. The fine was to be doubled if the crime had been committed in the presence of a Christian. When one was convicted of informing, he was branded on the forehead with a red-hot iron; if he were convicted of treason three times on the testimony of two trustworthy witnesses, the court rabbi was required to bring about his execution at the hands of the royal alguazil. Did the informer escape, so that he could be neither killed nor branded, he was proclaimed in all places as a traitor, completely excommunicated from the community of Israel, and stigmatized as "blood-shedder" or "villain" (see the statute in "Jahrbuch für die Gesch. der Juden und des Judenthums," iv. 307). In northern Africa, as in Castile, the law was visited upon informers in all its severity. Simon ben Ẓemaḥ Duran and his son Solomon passed sentence of death unhesitatingly upon moserim. Worse than in Spain were the conditions in German countries, where the governments protected the informers. The expulsion of the Jews from Augsburg, Nuremberg, and Ratisbon, and the persecutions in Posen, Frankfort-on-the-Main, and Wormsare traceable to informers. A certain Hirschel Meyer, through his denunciations, caused his coreligionists much trouble previous to their expulsion from Vienna in 1670. The practise of giving malicious information lasted longest in Poland, where moserim, with the approval of the government, were punished by having the tongue or ears cut off. In Posen a Jewish informer is said to have been sentenced to death, in accordance with the verdict of a Jewish court, so late as the last decades of the eighteenth century (Perles, "Gesch. der Juden in Posen," in "Monatsschrift," xiv. 166). The informer who escaped punishment was excommunicated; and he then sought refuge in baptism. The number of those who, after baptism, appeared as accusers of their former coreligionists, and who, like Nicolaus Donin, Joshua al-Lorki, and Pfefferkorn, brought unspeakable suffering upon them, is very large. Hamburger, R. B. T. iii., Supplement, p. 5.